Welcome to art for all, the Sketchbook Skool podcast. I’m your host Danny Gregory. Each week I bring you stories, ideas, interviews and inspiration to keep you company while you work on your own creative project. Whether you are painting, writing, composing or cooking dinner, I hope this episode inspires you. That’s our mission at Sketchbook Skool, to help encourage art for all. My brain is a plowed field. The earth is tilled, furrowed, but its outer crust is dry and unyielding, thick and hardened by the sun and wind. Birds fly over head, landing now and again to search for a morsel, to hope for a shallow worm. They amble back and forth on sailors legs, browsing, pecking, then abandoning the fruitless quest to heave off the ground, the first few flaps graceless as they clamber up onto the air and off in search of richer yield. My brain lies slumbering beneath its crusty mantle. Deep beneath, processes turn, but slowly. What seems like a barren landscape to the bird’s eye is actually an empty incubator, a lock waiting for a key, a gleaming engine without a spark, a plowed, tilled, and unplanted field. My brain has recently been harvested. Its bounty has been wrenched from the ground, pulling up clots of earth and leaving behind tendrils of severed and abandoned roots. But this is not a battlefield. The harvest, despite the clawing blades and brutal plunder, is not about death but transition. Ideas have been reaped but the field will grow again. But first it must rest. It must turn wounds into scabs into scars into smooth, undulating, yielding hummocks awaiting new seeds. My brain needs to be fertilized. It awaits the rich loam of ancient ideas fermenting on library shelves, in dusty secondhand bookshops, on museum walls, in the twilight of flickering cinema screens, through the haze of a pre-dawn jazz club. It broods gently until bags of seeds are trundled in, gathered from earlier generations who have surrendered them to share. Inspiration is pruned, then strapped to cold tree trunks, and slowly the grafts meld with my mind, sparking new life, a genetic stew that begins to emit steam till it roils bubbling forth, filling the air with the intoxicating fragrance of fecundity. It has been three years and two weeks since I began writing my last book. Actually my last two books. In a furious burst of creative energy I wrote, illustrated and designed two entire books in the same six month period. Soon after, I decided those would be my last two books. Gripped by post partyum creative depression, I decided there was no pointing ever writing a book again. I’d said all I had to say. Books were a relic that made no sense in the digital age. I told my editor I’d get back to her if I ever change my mind but in my heart I knew I was done. My blog posts reduced to a trickle. My drawing habit became more intermittent. Crossing the finish line of the double marathon had exhausted me in a way I couldn’t see at the time. My tank was empty, the needle on red. Now I am up at five a.m. to write my new one. The energy that I pour into writing slops over, filling extra buckets standing at the ready. 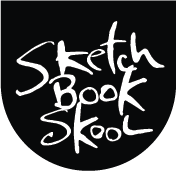 I come awake with ideas for new Sketchbook Skool kourses, new personal projects, new podcast episodes. I am ablaze. But first I must write this book. I have three weeks, twenty one days, to get in the first installment of pages, and the boiler is stoked, the pistons greased, the fly wheels spinning. I discover that I have been writing this book for much longer than I realized. I look in my files. Ever since August 2015, a week after I handed in my last book, I have been storing away miscellaneous ideas in a folder on Evernote, my archive in the cloud. It’s called “new ideas book/novel/screenplay/podcast/blog/what have you” That’s the actual name of he the folder. That name has grown longer as I keep adding more hyphenates, more forms I want to dabble in. books. Novels. Screenplays. Podcast. Blogs. What have you. Every time I come up on a provocative sentence in a book, I highlight it and chuck into the folder. When I feel a little idea pop up as I walk my dog, I open my phone, jot it down and throw it in the folder. When I wake up at 3 am, my mind whirring, I scrawl it in my bedside notebook, and the next morning I snap a photo of it and throw it in the folder. The folder with the long name has begun to bulge. There’s movement inside. Life is stirring. A quickening deep within. Before I speak to a publisher, before I sign my name by the little arrows on a contract, I browse through the bulging folder. There’s a lot of crap in here. But I see some threads weaving through it. Fuzzy, indistinct connections that with care and exercise could grow into broad arteries and nerve clusters. I can’t see the road but I can sense it. There’s something in there. I open my book writing app. It’s called Scrivener and I notice that there’s been a new version released since I opened it last, back in the halcyon days of my last draft. I’m not sure if Im committed enough to writing a new book to cough up forty bucks for the upgrade, forty bucks and few weeks of learning the bells and whistles of a new version. I decided to keep working in version 2.8.1. Maybe if I hit oil, I’ll spring for the upgrade. I hi light the contents of the bulging folder, my shopworn nursery of bits and bobs, and dump them all into Scrivener. Soon I have a long column of entries, what looks like order, but is really a heap of miscellanea. I read through them one by one. It’s chaos. What was I thinking when I wrote this? Why did I think that was worth noting? What on earth is this doing here? It’s like sifting through a pile of dirty rocks, hunting for ore. I let everything stew for while. I read some books, I watch some movies, I doodle in my sketchbook. When I come back to the nursery, I see the threads again. Patterns emerge. There are commonalities and themes in here I can work with. I sketch an outline. It doesn’t flow but it has buckets for a lot of the snippets I’ve been gathering. I start to throw things into heaps. Form emerges. I skim through it again. I can see an idea in there. But there are holes. Do I stop and gather more? Or do I start to write. It’s a crossroads. If I stop to do more research, I will have more flesh on the bone. But research is a great excuse for dithering. It can become a never-ending distraction. I need to actually write. So I plunge in and start putting down words, sentences, paragraphs. I open each note, read it through a few times then go to the top of the file and start typing. What emerges fans the spark that was hidden in the scrap of an idea. It builds on it, turns it, shapes it into a sharp edged brick, one of many that build the foundation of the book. Then I turn to the next note and begin to mine it. Sometimes I work for hours. Sometimes I just drop in to write a few words. Sometimes I arrive with an idea. Sometimes I just feel like writing, an itching urge deep in my gut. Sometimes I really don’t feel like it at all but I must. The whining struggling three year old inside me that just wants to go out for ice cream, is hushed by the part of me that wants the richer pleasures of seeing the pages pile up. I speak to my publishers, and eventually a deal is done. Everyone Is eager to get the book out. So eager that they propose a ridiculously compressed timeline and I am so eager that I agree. I feel the wheels turning. I can get it done. Before the ink has dried, I screech to a halt. Suddenly I have a hundred other things to do. The book can wait. I have crossed the Rubicon, I have a signed contract. The battle is won. But, of course, it has not yet begun. The battle within me to keep working. To not rest on my meager laurels. Why has that passion so quickly faded just as I walked from the altar? Why am I so quick to find a thousand distractions.? I make long list of what I need to do. I turn to other projects. I have meetings. I make calls. I watch sports on TV. I sleep badly. I feel a tension knotting my stomach. Maybe I need a vacation, a massage, a haircut. The only cure is to get back to work. I open Scrivener. There’s been another update. But my row of files are still there. God, there are a lot of them. I open the first one. It’s a lot less developed than I thought. This is crap. I’m in real trouble. I take a deep breath and I start to write. A week passes. I have worked through all the notes a second time. I see the thread once more. I follow it through the paragraphs, the notes, the sub notes, the folders, the book. The outline shifts and flexes. Parts slide from one end of the book to the other. New connections appear, blood is flowing through my ideas, pulling them together. I write on automatic, words flowing through my fingers. I barely pause to review what I have put down, trusting my process, my skills honed over the entire of my life. I have been reading books since I was four. I can do this thing. I read what I have from beginning to end. There are gaps, thin frameworks awaiting meat and detail, but I know how to flesh them out. For now, they are just placeholders but I know how to fill those places, and so I read on. I feel a voice in the islands of words. I know what it will be like to hold this book, how a reader will feel as she turns the pages, how he will respond to my murmur in his ear. I sense the relationship we will have, built on these notes on the screen. The seeds are set in the soil. They are sending out roots, tendrils,unfurling a stalk with a single leap. poking through the crust, greeting the sunshine. The hard winter is over. Now I just need to keep tending and weeding. The work is taking over, pulling me along with it. It shows the path and it paves the way. My experience is showing me where I need to work today, how I need to work, what tools to reach for, how to know when it is good. The outline that guided me has been bricked over. It is an armature deep within that supports the enterprise. I can worry less about form and spend my time on polish and detail work. Occasionally I uproot a section and shift it to a different spot. Then I need to sand and buff the seams, making it blend, erasing the dislocation so it reads as if it was born there. I love this work. I wake up early to write, too restless to stay in bed. Ideas pop up as I watch TV, chop celery, walk my dog down Thompson Street. Every author I read throws up new thoughts, new approaches, new devices that I can blend into my own. I keep my wife waiting by the elevator as I stand at my desk and pound out the end of a sentence. My deadline approaches but it doesn’t loom. I will be okay. We will get there safely, in time. Creating takes all of me. All my experiences, my ideas, my influences, my weaknesses, my flaws, my fears, my fantasies, every drop of my energy. It wrings me out but it energizes me too. Soon my field will be filled with green, stretching to the horizon, leaves swaying in the summer breeze, vital, beautiful, my creation. Do you feel the desire to create smouldering inside you? Do you just want some help to turn it on and the skills to make the most of it? Or are you afraid you have lost the urge and can’t figure out how to get it back? We understand. All the people at Sketchbook Skool are creators too and we are all too familiar with the ups and downs of the creative process. If you’d like to be inspired once again, we’d like to give you a free book to help to start things moving. It’s called “The Ten Minute Artist” and it’s full of ideas and tips from the Sketchbook Skool Fakulty on how to start your creative habit, even if you are super busy and strapped for time. No matter what your skill level, or age, you can make art! And this free ebook will help you start. You can get it at sketchbook dot school. Just go to the section called Free stuff and get a copy. Or look at the program notes for a direct link. Thanks for joining me for another episode of art for all. I hope it kept you company while you made something wonderful of your own. I’ll be back next week with more ideas and stories to keep you creating. See you then. Next Post Podcast 06: Call yourself an artist? Oh. Good. I’m so glad. Wow–that was beautiful–I felt as if I were living in and through the creative process–and it was hugely inspiring–sometimes one looks at what one is doing and just feels so discouraged–you walked through it all. Many thanks.